There’s a hidden danger lurking in your walls. It’s your electrical wiring and circuits. Most of the homes built as little as 15 years ago were not designed “electrically” to power all the gadgets that modern life has to offer. This can cause trouble, and a potential disaster you may not even be aware of until it’s too late. The problem is compounded when you combine the aging electrical grid with the strained electrical circuits in your home. When you add all of your lighting, power-hungry appliances, gadgets, and electronics, the load can be too great, and that may lead to shorts and fire. Do you have a tangled mess of extension cords and power strips plugged in to a single outlet? Odds are you do, and this has the potential to burn your home down – to the ground. 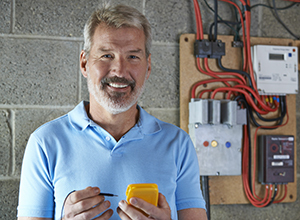 At ElectriCall, our basic electrical troubleshooting service will troubleshoot these issues and more for you, and point out any signs of electrical problems in your home, so you will know you are safe and secure. When we come, we will look for issues simple and complex. Like using too high of a light bulb wattage for the fixture; making sure you have the correct amperage breakers for the wire in your fuse box; ensuring you have enough outlets; ensuring you are not overloading your circuits; ensuring your connection to the pole outside is secure, clean and weatherproof; we check for GFCI (ground fault circuit interrupt) outlets within 4 feet of every water source; We check for unsafe aluminum wiring in your home; loose junction boxes and much more.